We just recently added this early Black Forest clock to our collection. This is a Period piece made C. 1850. The peddler has become a symbol for the Black Forest and these clock have been made from 1850 up until present day (with major differences). Our peddler is made from tin on a fantastic burl wood base and stands 15" tall. 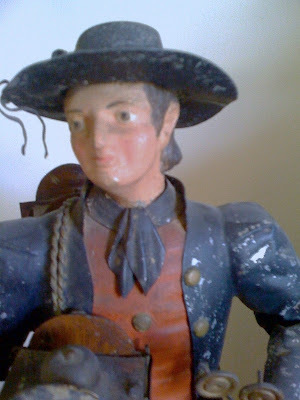 The paint on the figure is original and untouched, with very minor loss. In his hands he holds a miniature functioning timepiece that is 3" tall. The clock works is a thick brass plate miniature clock work. This clock has its original "mock" weights... pendulums in hand and "mock" time piece on his back. 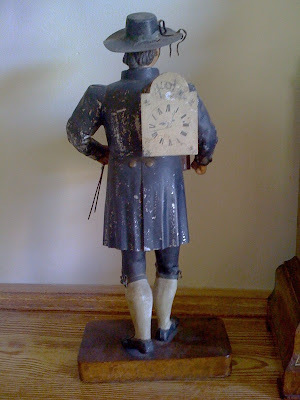 The dial of the clock on his back lifts up to revel a compartment to hold the key... he even has its original miniature key. 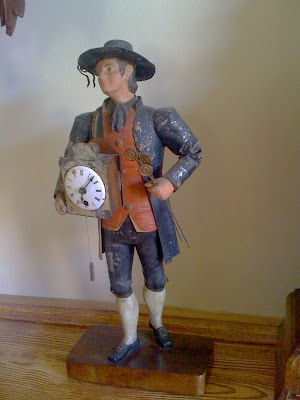 This is the second period peddler timepiece we have owned, we traded our last one off as it had too much repaint for our liking, and he was missing his clock on his back. This example was purchased by the previous owner while being stationed in Germany during WWII. It has been in a box in storage for over 50 years... and was wrapped in old German newspaper from the time. We are excited to get a very clean original example of this hard to find BF clock for our collection. Hi i have a clock peddlar very similar to the above pics. He is 14 inches high and standing on a round tin base. He is in good condition and has been in the family forever. Unfortunately the front clock is missing and we only have the imitation back clock. What sort of value would you put on this? We wouldn't be able to put a value on it. Sounds like you have an interesting piece! Thanks for your interest!